← Matzah holder (3 pockets) in 30 min. Our art classes are 25 -30 min., which includes the giving of context and the cleaning of mess, so we gotta move FAST. Matzah Cover: this is what can cover the plate of matzah requisite on every table. 4. 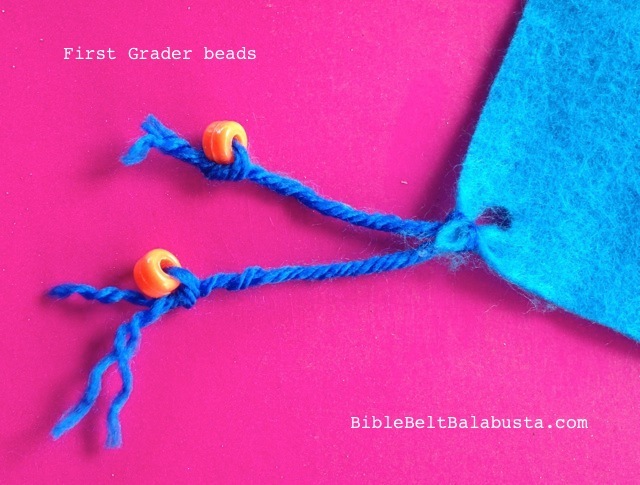 Each piece of yarn: tie a bead at one end. String however many. We used 6, and tied another knot on the sixth. Now, slide half the beads on each side, so you are holding the yarn in the middle with beads on both sides. Take that loop and insert it into the felt hole about an inch or so. Pick up the beads on the other side and push those through the loop. Sounds hard, but it’s easy. Tell the kid to pull gently to snug it up. Repeat for other 3 corners. My kid’s example. He only wanted one bead on each end. 5. 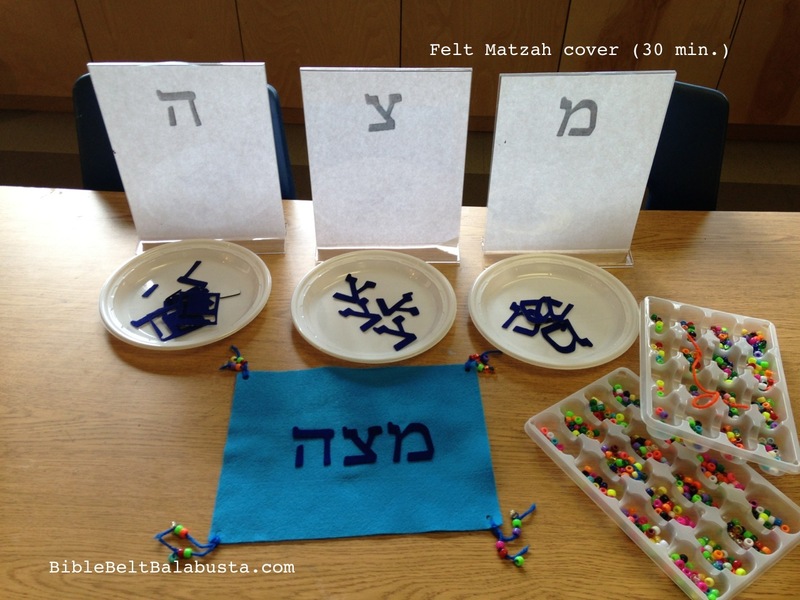 PAINTS: If you are not lucky enough to have a diecut machine and adhesive felt (lucky me), kids can use puffy paints to make the Mem, Tzadee, Hey, but give the kids a model of the correct spelling. I’d let them Sharpie the letter first, and then they could squeeze the paint to cover the Sharpie. P.S. Even though the craft is short and sweet, there is still time to give context: why we need matzah at the seder, when does it “happen” at a seder, how we use it, how we cover it while we bless it, and so on. And show some matzah, too. We used egg matzah as a snack, so we wouldn’t “spoil” our taste for the really real seder matzah coming up.